You can listen to 'State of grace' here. In my musical reference bible, Dutch Music newspaper 'Oor', there's a reviewer who writes in an enthusiastic and appealing way on punk (pop, rock, core, whatever) and thus entices me to listen to the music of these bands. Thus I've encountered several albums that I really like and started to play regularly. Where I hadn't really listened to punk music for quite some years. Dropkick Murphies were the last to interest me around a decade ago. 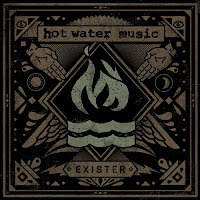 The latest addition on my Ipod is Exister by Hot Water Music. This fast paced punkrock album is laced with up tempo anthems meant to sing along to arms raised fisted in to the air, in a fest of fiery abandon laced with anger on the part of the singer. This is the paradox that (albums like) Exister offer to listeners. The anger and energy band puts on offer, lead to moshpit abondon in concert halls and stage diving, with the odd nutcase among the partying people who's out to hurt hard. 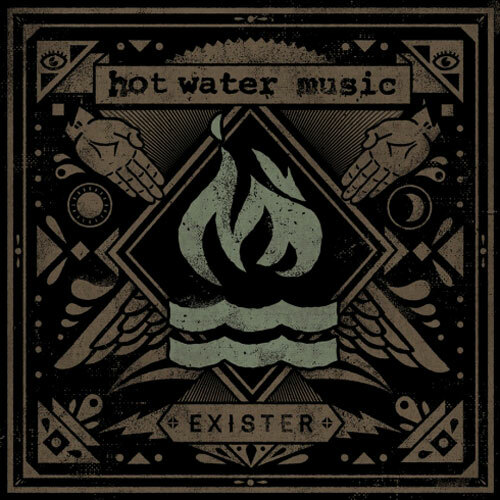 Hot Water Music released its eighth studio album with Exister, but its first in eight years. The band's around since 1993 but after a short break in 1995, broke up in 2005 to finally release a record again in May 2012. Exister goes way beyond the average. The drummer and bass player do not just play your average rhythmic accompaniment. There's a lot going on there. Drummer George Rebolo is all over the place. In some songs he even seems a solo artist and not the one keeping the band's sound together. A drummer in the vein of Keith Moon or Ginger Baker, but hitting much, much harder. He plays in a very dominant way, with regular accents, fills and rolls that make it fun to listen to him exclusively with the band as accompaniment. Bass player Jason Black manages to put in nice melodic lines under everything else that is already going on, with this clear, beautiful sound. Both make Exister even more interesting. And I have to add, that the mix provides the room to excel. Not all songs are filled to the brim with noise. The mix at times is open as is the guitar playing, leaving room for drums and bass. Another add up to the level of interest. The two front man steal the show off course. Chuck Ragan and Chris Wollard both sing, separate and harmonising. With loads of whoas in there. At the same time their guitars interweave from rhythm into melody or lead, like their singing does. Both have a rasp to their voice. The worse for wear and tear of singing punkrock songs with the full heart for two decades. It gives Exister a very authentic sound. Hot Water Music never forgets to put melody into the song. "No end left in sight' is the song that springs to mind to mention first. It has this dragging quality, un-hasting, but a great melody and interesting guitar rhythm. In the end this goes for most of the songs on Exister. Hot Water Music recognises a good melody when it presents itself to it. Social Distortion is a good reference here, but a melodic punk band like The Buzzcocks is no stranger to them either. The band combines a few winners in it self that makes it stand out and win. Rock from the 60ties like The Who, British punk from the 70ties and US punk from the 80ties, refrains the likes of Rancid and melodies from almost anyone worthwhile in music. Exister is a great and relevant comeback album from a band I'd never heard of before. Time to check out things backwards.